I’m starting a LIVE Webinar Tutoring/Mentoring Vedic Astrology Study Group for students studying Ernst Wilhelm’s beginning courses. I’m calling it The Astrology Lab for short. This study group class is an online, weekly, live webinar format (video, audio and with screen-sharing so you can see the charts under discussion). Get the details below. 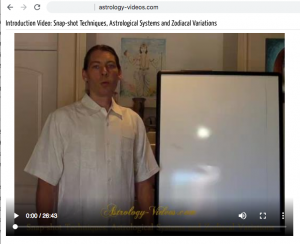 We are starting with Ernst’s beginner courses at Astrology-Videos.com. 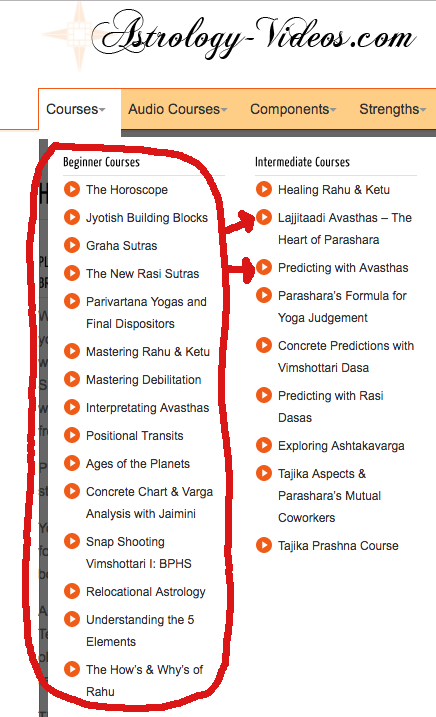 We will go through all the courses under the Beginner Courses tab (see snapshot to the left). After we have done that, we will thoroughly study the AVASTHAS so you have a complete technique with which you can use to give an excellent reading. The Avasthas of the planets is a ‘bread and butter’ technique used regularly in natal chart readings. We will practice using this technique on plenty of natal charts. Mastering this technique will significantly increase your confidence in giving a helpful and transformational natal chart reading. Bring your charts to the study sessions so everyone can learn from your questions. Being part of a live study community will accelerate your knowledge of astrology whether you decide to become a professional astrologer or not. If you plan to be a professional astrologer, I will discuss the business side of astrology (the mentoring part) too. As of this March 2019, I will have been a full-time astrologer for eight years. 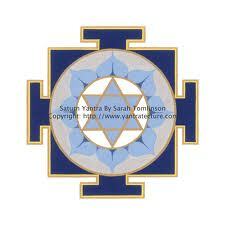 There is much to share about working with clients and making a living as an astrologer. Including what I would and wouldn’t do if I could do it over! If you have been in learning environments with judgmental teachers who ridicule your questions and are too dry and abrupt with you, know The Astrology Lab is not like that. Bring a curious mind and a sense of humor, and we will have a great time while we learn. I will do all that I can to encourage and support you on this fantastic journey. I mean, how lucky are we to get to study this incredible knowledge?! You’ll need to be enrolled at Ernst’s site Astrology-Videos.com, and starting the Beginner Classes. I won’t be teaching these classes from scratch; I will be tutoring and providing a live webinar study format based on these classes – you bring your questions, charts, etc. We will be going in the order of the courses as they are listed. If you’ve already taken a few of the beginning classes, you will get a chance to review, test your knowledge, and contribute your experience. You need to get Kala software if you don’t already have it. You will also need a computer with a reasonably updated operating system and a fast internet connection. If you can watch Netflix and YouTube videos, your system is quick enough. We will use the ZOOM platform, and I will send you the Zoom invitations each week. All you’ll have to do is follow the prompts and Zoom will download an app to your computer that will allow you to get into the live webinar class. Your computer will need a camera so we can see each other face-to-face (and the other students in the class too). If we get a lot of people joining the class, we will split the group into two, and I will open up an additional day in the week to meet. The group will start on February 16th at 11:00 am, Pacific Time. The Moon will be bright, nearly full, and in the fertile sign of Cancer on that day. All designed to support your growth! You can register for the class between now and then by emailing me at Karen@DivineTimeAstrology.com. It is a MONTHLY subscription for $97 for 60 to 90 minute weekly sessions – a good deal because you will be getting at least four live sessions a month for this price. I charge $67 for 60-90 minute individual tutoring sessions which would come to $268 a month for weekly meetings. We will take a periodic break about every eight weeks or so and on major holidays too. I don’t know how long it will last yet. It depends on how quickly we progress through the courses. It will likely go faster for the simple stuff and a little slower with the more complex concepts. If you can’t always make it to the class sessions live, there will be recordings available so you can catch up. You can send me your questions before the class, but class attendance and participation are required to get your questions answered. YOU CAN EMAIL ME: Karen@DivineTimeAstrology.com if you have questions. I’m excited to get started and hope to see you there!